Sitron introduced our first Thermal Dispersion Flow Switch in 1995. Thermal Dispersion technology provides liquid and gas flow detection with no moving parts and a much greater working life-span when compared to other technologies. 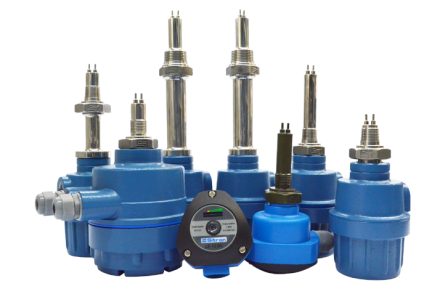 While our original flow switch has been updated and improved upon over the years, one thing has not changed; the CF12 series continues to offer maintenance free reliability for most liquid flow or gas flow applications at a very reasonable price. Like all of Sitron’s products, the CF12 can be configured to accommodate our customer’s unique process control requirements. Offered in either glass filled nylon, aluminum or 316SS housings, all models can also be ordered with a great variety of threaded, flange, or sanitary process connections as well as Halar or epoxy coating for aggressive mediums or even with separate electronics and process sensor. While the CF12 is designed to monitor flow status of liquids and gases, it is often used to detect the level of liquid mediums as well. Enclosure Material: N1-Glass filled nylon, G1/G2/G3-Aluminum, A1/A2-316S.S.